First date. Martinez as Pac and Orozco as Nina. Photo by Liz Lauren. That’s the way Nelson Algren and I feel about Chicago, city of my birth where I’ve lived for most of my life. It’s corrupt and violent, beautiful and vibrant. But I love it, mindlessly perhaps and despite, or because of, all its warts and flaws. Monica Orozco shines as a smart, energetic Nina Esposito, dedicated to getting rid of the downtown developers who want to gentrify the neighborhood with big buildings and big business to drive out local business owners. She gets help from Pac (Eddie Martinez), recently released from prison who returns to find his old neighborhood drastically changed already—a school closed, local businesses shut down, the former El stop bypassed. And from Robinson (Robert Cornelius), a local business owner who’s hanging on, and Benny Platt (Anish Jethmalani), a reporter for the Daily News. Once Nina is elected, her assistant Manda (Sasha Smith) is a big supporter, and even Amena (LaKecia Harris) who works the streets and sells drugs, has the ward’s interests at heart. Nina’s adversary, the cagey bad guy representing the downtown interests, is Applewood (Jerome Beck), who wants to construct a big development that will bring new residents, higher rents and more businesses to the area. Rightlynd begins with Nina’s awakening as a neighborhood activist and concludes two years later, as she learns what it takes to succeed in Chicago. The story line is blended with musical set pieces, dance numbers, Nina and Pac’s first date and its romantic consequences. The six actors (all but Orozco) play many roles with simple additions of garments or headgear. Director Lisa Portes keeps everything moving along smartly for this 95-minute production, although there are occasional plot or dialogue snags that show the script’s recent completion. The cast is uniformly strong and benefits by Portes’ direction and pacing. 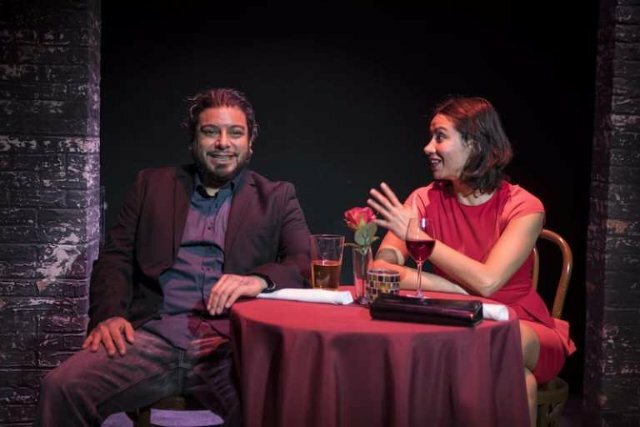 In addition to Orozco’s excellent turn as Nina, Martinez, as the earnest and soulful Pac, and Jethlmalani, as the reporter with civic interests, provide outstanding performances. Sasha Smith as Manda is versatile and charismatic in several different roles. Rightlynd is one of seven plays by Holter that will constitute a Chicago story cycle. Teatro Vista staged The Wolf at the End of the Block last year. Two world premieres will be staged next year at Steep and Goodman theaters. In an interview earlier this year, Holter described the overarching theme of the cycle: “They’re often about someone who comes from nothing, and then tries to make things better, and then ends up becoming what they hated.” Holter writes realistic characters and dialogue that sizzles with Chicago style and poetry. After you see Rightlynd, I predict you’ll look forward to the next Holter production. Rightlynd continues at Victory Gardens’ Richard Christiansen Theater (2433 N. Lincoln Ave.) through December 23. Tickets are $27-$55 for performances Tuesday-Sunday. Discounts are available for students and seniors. Buy tickets online, email tickets@victorygardens.org or call 773.871.3000.